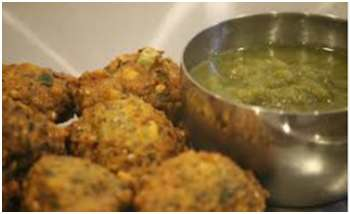 Mangode are the green split lentil dal Fritters. It is very delicious and popular all over Indian as an appetizer and evening snacks. Especially, Moong dal kemangode is favourite snack in Rajasthan, UP and Gujrat. Mangode can be served with green coriander chutney. Mangode cannot be made instantly. Pre preparation is needed. To make mangode, soak the moong dal in water for 5-6 hours, after that coarsely grind the dal combined with cloves, ginger and green chillies. Then mix salt, red chilli powder, fennel seeds, chopped coriander and chopped onion in this grinded dal. Heat the oil in a pan, take some paste (approximately 1.5-2 teaspoon paste) in the fingers and drop it in the pan on medium flame. Similarly drop more paste in the pan to make more mangode. After that deep fry mangode on low flame till they become golden brown and crisp. 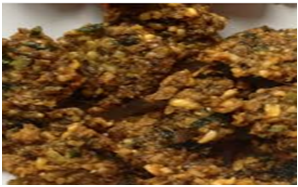 Serve this tasty snack with green chutney, amchoorkimithi chutney and a hot cup of tea.